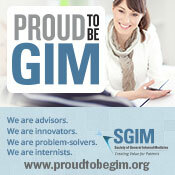 Skills Development Opportunities: Participate in one of SGIM and ACLGIM’s skills development programs and events: SGIM's Career Development Workshop Series, ACLGIM's Leon Hess Leadership Training and Management Institute, Winter Summit,the LEAD Certificate Program, and the UNified Leadership Training in Diversity Program (UNLTD). Mentoring Programs: Find or serve as a mentor. Offered in a variety of formats, mentoring at the national and regional level provides opportunity for students, residents, fellows, and faculty to access mentors during the annual meeting and have their questions answered on issues around career growth and practicing general internal medicine. We work with others to increase our impact. doctors and their patients, and medical research.